November 4th is the date for our annual club drive to Starved Rock.? This drive is always a club favorite. WHAT: A MINI drive exploring a bunch of fun back roads out to Starved Rock State park.? ?After we arrive, people can hang out, visit, eat, ?and?explore the park on?your own. 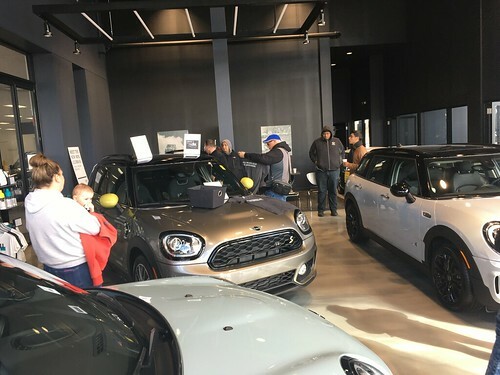 WHO: All Chicago MINI Motoring Club members or anyone interested in the club. WHAT TO BRING: A full tank of gas, appropriate clothing for the weather outside, a camera, lunch money, optional FRS radio for in-car communication? tuned to Channel#1 SubChannel #1, and a smile. WHY: Because it is fun!! ADDITIONAL INFO:? Here is some information from Lee on some area food stops close to the start of the event..
FYI and for others who are going, there is a Panera off the southeast corner of the Meijer parking lot where we’re meeting. There’s a Starbucks in the Target across IL59 from Meijer. Finally, there’s a Dunkin Donuts on the southeast corner of IL59 and Aurora Ave, which is the intersection just south of Meijer. Feel free to make that more generally known so folks can get a coffee and or a snack before we head out. Looking forward to the drive! Looks like if I have the mini back together by that weekend, I’ll bring the kids out for a nice ride. Be my first outing with the club so I hope it goes well. Myself and Jenny will hopefully make this one! We’ll be there — first outting! Tawana and I will be there! Enrique & Carrie – we did our first run earlier this month – you’ll have a great time! Im planning on being there with possibly another MINI too. Weather permitting, in for two. Weather permitting?? Any day is a great day to take a MINI trip 😉 We’ll try to make it sunny day for you. I’ll be there, good or bad weather. We’ll be back from MITO and ready for this drive. Looking forward to it. Planning to attend, looking for FRS radios. Not finding them in electronics stores. Besy Buy has several on-line. Are the models with “privacy codes” the right ones? We had bought a set before, but it seems the current FRS/GMRS models didn’t have subchannels and would only receive, not broadcast on the club rides. There’s a Cobra “micro-TALK” model that has privacy codes for the 22-channel FRS/GMRS channels. Anyone have an idea if this will work with the club? Any alternative suggestions on what to get/where to find? Would like to get them before 04 Nov. Thanks!! Hi Lee.. I haven’t looked for FRS radios so I am not sure where to best get one or even how much they cost.. The set I have is a 12 year old Motorola T5200 Talkabout. The key feature is to get sub-channels (I think the “privacy” channel is the same thing). Otherwise you would only be able to listen and not talk..
We use the radios mostly for communication to keep our group together so we try to keep someone with a radio in the front, the back and a few at least in the middle.. some other clubs are much more “chatty” on drives. Steve, do your radios only work when in close proximity to each other? Generally it is a mile or so range I believe.. Thanks Steve. I found a used pair of the same make/model you have on Amazon for $34.99 delivered. No literature came with it, but found the user manual on-line. That Internet has everything! My thanks for your recommendation. Phyllis, Eric, Allie and I will all join the ride in “Dory”. I bought mine fairly recently at Dicks, they had a 33 mile range and it took us to the end of last trip to figure them out (it was very new to us), but they now work great. They had three different models there, all less than $100.00. Chris and Kat will be there! I am trying to get the Pontiac MINI’s together to join you guys! We may have 2 or 3! I hope we can join you guys again! Very cool on organizing Pontiac MINIs to join up. The radios are close range.. probably 1/2 mile to a mile depending on how open the area is. We plan to attend. Looking forward to it! I hope to attend and bring Jackie! This sounds fun! Definitely going to bee there! BEE MINI and I plan to be there! We’ll be there – recently joined and first outing! We’ll meet you there, Francis. Lillian and I will be there. We are planning on making the trip. Huge thanks to everyone who came out to the drive today.. I had a blast!! Thanks for all the planning and hard work Tawana and I had a great time! Wonderful to see everyone again. Really miss this event, glad it went well! “Hello” everyone!